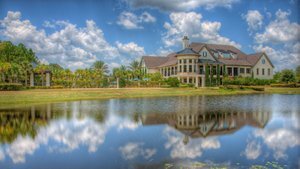 If golf is your game, and Florida your destination, ICI Homes can hook you up. Nope, we’re not marketing. We’re sharing super-secret, BFF-worthy, inside-scoop details on the best golf and country-club enclave in northeast Florida. And we’re totally serious. That’s how much we think you’ll love one of our top communities — Amelia National Golf and Country Club in Fernandina Beach. As Florida’s Custom Home Builder, we’ve built all over the state for more than three decades. So we have pretty good sense of what home buyers and potential customers seek in a Florida home. If you already live in Florida, but are moving to its northeast corner for any number of reasons (work, family, long-awaited retirement), the same parameters apply. Amelia National is gated and exclusive, without being standoffish. Folks wave from their yards and driveways. You’ll hear lots of laughter in its golf and tennis clubhouses. You’re only 10 minutes from salt water and ocean breezes, yet right around the corner from a popular, local burger joint. Homemade fries and milkshakes, anyone? Read on to discover why you should discover Amelia National. Can we stop there? You likely know the name and what it means. What it really means is, have we got a golf course for you! Because we do, and you’ll want to live here and play it. Joking aside, a Tom Fazio course means a golf and country-club community takes its reputation seriously. Fazio is one of the world’s top golf-course designers and his firm FAZIO Designs has created signature courses in 38 states and seven countries. He’s the guy who gets the fix-it calls from officials at legendary Augusta National, home of the equally legendary Masters Tournament in Augusta, Georgia. Not surprisingly, Amelia National’s 18 holes reflect Fazio’s touch. He’s renowned for working with a site’s natural topography and undulations. You normally don’t find features sprouting from a Fazio course and its immediate surroundings that wouldn’t naturally sprout there (one exception being courses carved in the desert Southwest). Amelia National’s tract plays off its coastal-forest locale, with thick stands of dark green pines, long-limbed oaks and feathery cypresses. Palms appear as though birds dropped their seeds long ago. You won’t be shocked by torrid banks of orange hibiscus borders, or other bright foliage, unless it grows in neighboring back yards. You will find languid, problematic bunkers and water. But Amelia National doesn’t play to punish; another Fazio trait is designing for all golfers, not only for the pros. Each hole offers strategies to the pin for the best in the business, and for beginners. It’s so affordable, you’ll wonder if this is a typo (it’s not): an Amelia National golf membership initiation fee is $5,000. We’ll wait while you catch your breath. Compare that to the $200,000 for membership privileges at Tom Fazio-designed courses in the northeast and mid-Atlantic, many of which you can’t play in winter. Which lasts at least three months. Even if you could play those courses in the cold, who wants to swat the little white ball while dressed like Frosty the Snowman? We don’t. That’s why you should live here. Golf clubs aren’t the only sporting implement you can swing if you become an Amelia National resident. 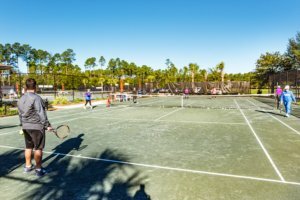 The tennis club boasts eight Har-Tru courts — two are stadium courts — and an omnipresent USTA staff. The 1,500-square-foot clubhouse is Tennis Central with its wraparound porch and comfy white rocking chairs. It’s located next door to the golf clubhouse, so folks active in both can go back and forth with ease. 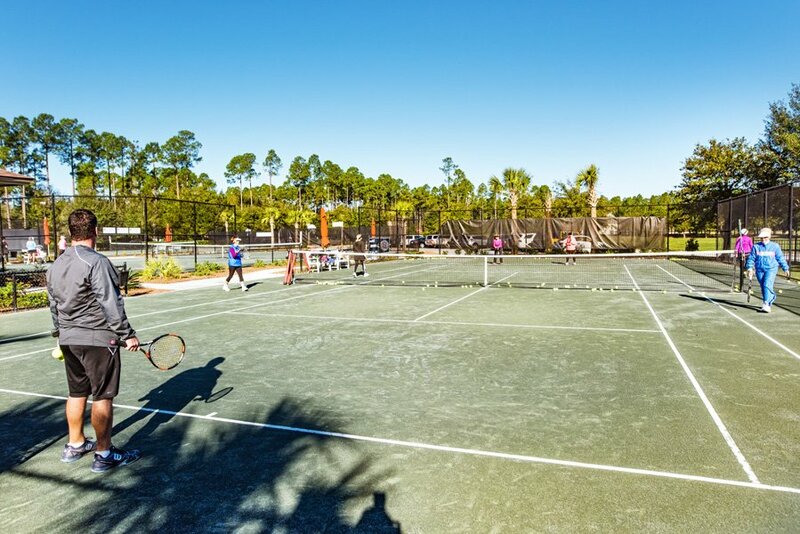 Tennis leagues, camps and youth clinics are calendar staples at the tennis club. Someone’s always swinging a racquet here. Someone’s always jumping in the large resort-style pool, too, located on the more private side of the golf clubhouse and accessed via a zero-entry design. Its size, pergolas and sun deck foster privacy in nearly all circumstances except a middle-schooler’s birthday party. Can we talk about the social scene? Amelia National’s golf clubhouse — a statuesque French Provincial structure — is the anchor. Light, natural stone flooring, interior mirrors, airy light fixtures and nooks and crannies invite hanging out. Yummy smells from dining rooms and laughter from the 19th-hole grill and bar confirm that you should do so. Amelia National’s dining and social offerings touch all the traditional country-club bases — yes, you’ll look nice at dinner — without being stuffy or restrictive. Just check the community calendar. There’s always meetings, projects and neighborhood groups to join at the clubhouse; grab a bite to eat while you’re at it. For a quieter night, take your adult beverage outside to a terrace and count migrating geese on the lake. All this becomes reality with Amelia National’s social and dining memberships. Pick the one that fits you and yours. Let’s back up for a moment. If you’re seriously interested in living and playing at Amelia National, (A) make sure to continue reading (B), you’ve likely already done some homework, so you already know where in the world Amelia National is located. But there’s a reason in making this point. Amelia National is located in Florida’s Nassau County, the state’s eastern gateway. It’s only 10 minutes west of Amelia Island, one of Florida’s most unspoiled beach draws, and a visitor-magnet historic town in Fernandina Beach. Still plotting with us? Amelia National also is only a half-hour north of metropolitan Jacksonville, one of Florida’s largest cities and busiest ports. Interstate 95, the state’s north-south artery, is only 10 minutes west of Amelia National. What does all this mean? You’re in the middle of a highly-sought beach lifestyle at Amelia Island. A boating lifestyle on the Atlantic Intracoastal Waterway. And a peerless golfing lifestyle in your own backyard. All this for a fraction of the cost of a beach house ($$$$! ), and a typical Tom Fazio-designed golf-course community. The lifestyle is the same! But, isolation is not something to be worried about. Cruise over to Amelia Island for dinner at one of Fernandina Beach’s low-key, hot-spot restaurants. Head south 30 minutes for cultural events and concerts in Jacksonville, or cheer on the city’s NFL team, the Jacksonville Jaguars. Head back home — straight up I-95 — to Amelia Island for a peaceful good-night. How about convenience? Jacksonville International Airport is 20 minutes south on I-95. Amelia National residents are only two hours from Orlando and its legendary attractions, and only five hours from Atlanta, Georgia, the country’s ninth largest media market. This fact is significant regardless of whether you have a family with school-age children: Nassau County schools are A-rated. That designation carries distinction because parents want their kids to go to A-rated schools. They seek communities in those districts, fostering new and better housing, competitive building booms and rising property values. Amelia National is the middle of Nassau County, only a few miles south of the county’s main east-west highway, State Road 200/A1A — 8.5 miles of which are being widened from four lanes to six, with accompanying bike lanes. What other good things are happening here? Although largely rural — it contains vast timber tracks and nature preserves — Nassau County is growing because of its low-country beauty, natural resources and great location. More roads than S.R. 200/A1A are being widened and shopping and services are being expanded. But the sense of history remains. Museums are everywhere in historic Fernandina Beach and the more inland town of Yulee. Historical markers, and historic structures that have been repurposed as a fun restaurants, art galleries or bars lend character to the area. All of this is a sign that people want to be here. You should, too. ICI Homes offers prospective customers the opportunity to “try before you buy.” It’s a foolproof way to find out whether a community might be right for you, and the perfect solution for those who don’t live within reasonable driving distance. If you’re the latter, you have to trust online sources and searches unless you know someone familiar with the area, or are lucky enough to have nearby friends and family to bunk with. So, bunk with us. Book a Discovery Tour for Amelia National — a three-day, two-night visit. Accommodations are available in several affordable packages. When you arrive, you’ll spend the first day of your Discovery Tour doing exactly that — touring Amelia National and hopefully chatting up residents for additional information. You’ll be able to play the Tom Fazio-designed course (gotcha, didn’t we?) and enjoy clubhouse dining. Find more detailed information here, along with how to book and plan your Discovery Tour.